Space Monster: Space Monster caters to lovers of jam band music with their eclectic psychedelic style and high energy performances. An ambitious blend of funk, blues, reggae, and rock, there's something for everyone when Space Monster sinks into their unique style born out of love for all kinds of modern music. Their full-length debut album, Abduction, was released April 26. Mayfield: Mayfield is a five piece band based in Minneapolis, MN. Characterized by their energetic live shows and original sound, Mayfield represents the unique culture of the city they were formed in. Their music draws on their hometown's independent hip-hop and rock scenes, tapping into the best of both worlds. Corey Palmer & Lovetrade: Corey Palmer is a Minnesota-based singer/songwriter/producer known primarily for his time fronting These Modern Socks and Daykit. After taking an indefinite hiatus from music to raise a family, Corey was jolted back into music making after a near-fatal car accident in 2014 abruptly re-prioritized his life's intentions. He subsequently began writing and recording new material by himself, and eventually released his solo debut, the Love Trade EP.Corey now continues to explore a similar musical vein on his latest release, This Could Be About Anyone, while also sewing in numerous layers of analog synths, falsetto harmonies, and afrobeat percussion. Holidae: Holidae is the new project from local R&B singer Ashley Gold and veteran synth savant Garrett Neal. Combining pop sensibilities with futuristic soundscapes and a strong visual element, Holidae will haunt your dreams and soundtrack your adventures. Their debut album was released April 22, 2016. Formed in 2009, marked by their high-energy performances, New Sound Underground has become a staple in the Twin Cities music scene as must-see artists. Finding their roots in a myriad of different styles ranging from jazz, funk, fusion, rock, soul, R&B, and gospel, it isn't too difficult to find a wide range of different listeners and fans. New Sound Underground is working on a brand new album and continues to captivate audiences with their original sound around the nation. A Guided By Voices inspired brunch featuring a GBV DJ set by Justin Fitterman, a screening of Some Drinking Implied, special GBV giveaways, and more. 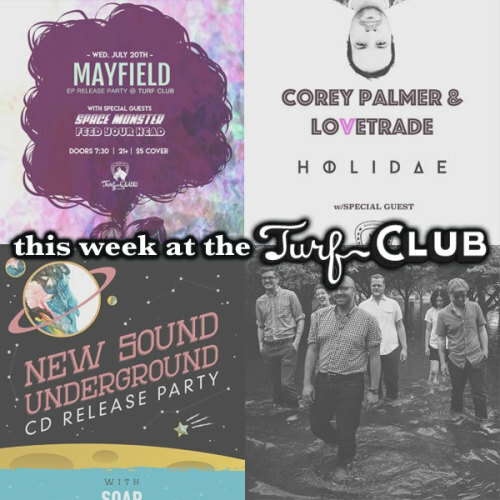 The Turf Club opens for brunch at 10:00am (All Ages event | No Cover).